Top left: photo by Bridget Woods. Bottom left and right: emerald carpet growing among black lichens. Photos by Joel White. 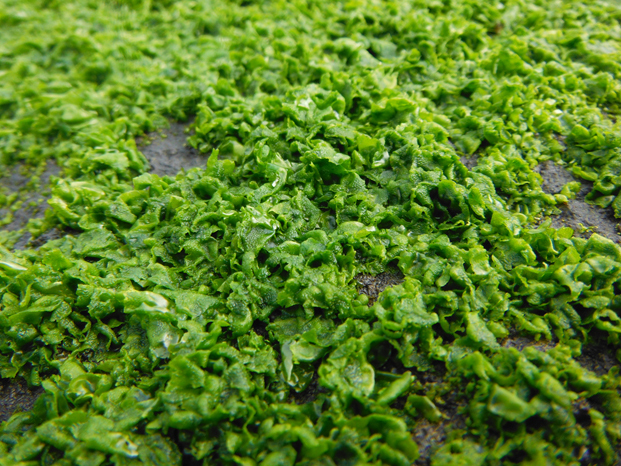 This green algae is composed of many tiny undivided green blades that usually have curved and hood-like tips. These blades have short stalks and grow to less than 1 cm long. Hundreds or thousands of these blades cover rock like a carpet. 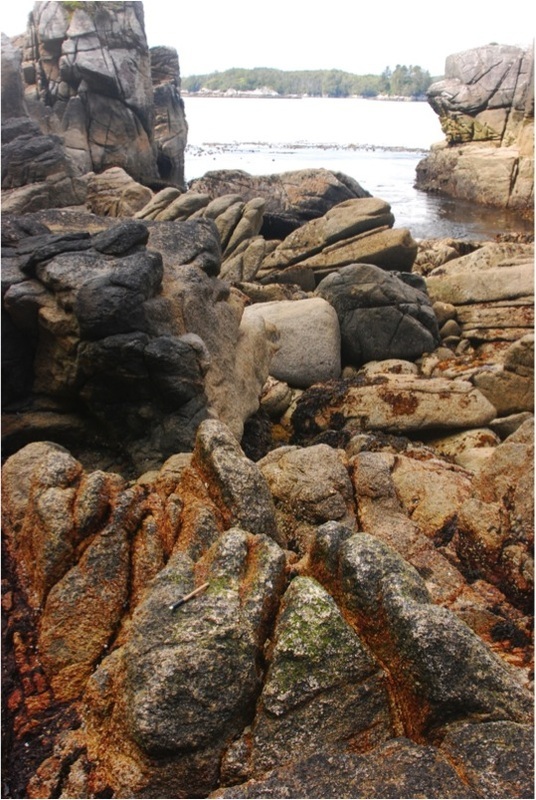 Emerald carpet is found on rocks in the high intertidal and above the high tide line. It grows at higher locations than most other marine algae, and is often found above even the uppermost acorn barnacles. It tends to grow alongside black lichens, and is often found near bird rookeries. Its range extends from the Aleutian Islands to California. Northern emerald carpet (Prasiola borealis) is found from the Kurile Islands to southern British Columbia. 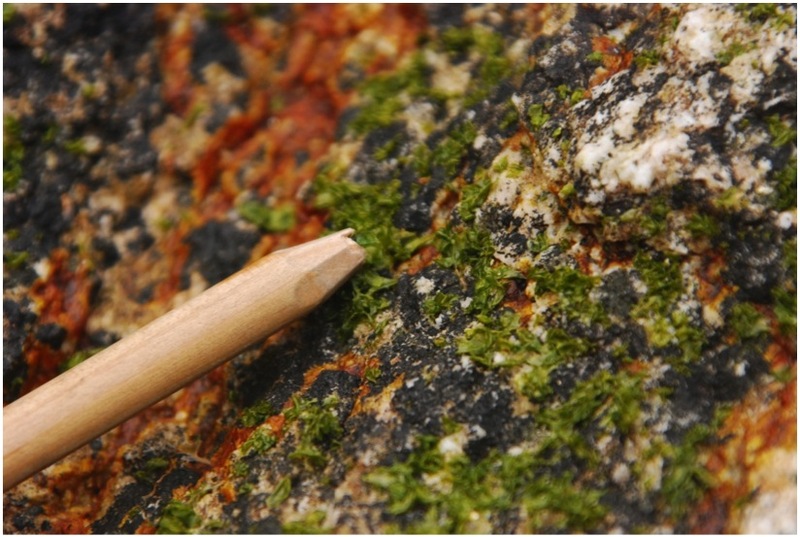 It is a lichenized algae - it is infected with a fungus called Guignardia alaskana. This fungus forms black patches on the small blades (also less than 1 cm long). Emerald carpet appears to grow best near bird rookeries - either on rocks where seabirds perch directly or underneath branches where birds perch. It receives high levels of nitrogen from the bird guano deposited at these locations. Lindberg, M. and Lindstrom, S. (2010). Prasiola meridionalis. Seaweeds of Alaska. Accessed 28/07/2014. O'Clair, R. and Lindstrom, S. Prasiola meridionalis Setchell et Gardner. In Klinkenberg, Brian. (Ed.). E-Flora BC: Electronic Atlas of the Plants of British Columbia. Lab for Advanced Spatial Analysis, Department of Geography, University of British Columbia, Vancouver. Accessed 28/07/2014.